Arizona has thousands of lakes with small, secluded sandy coves while the entire stretch along the Colorado River between the two dams is one long beach Riviera. Arizona beaches are mostly small, and many can only be accessed by boat, but they often offer a sense of privacy and seclusion rarely found on the sea coast. Most are part of urban parks like Gateway Park in Yuma or state parks like Buckskin Mountain Park or Cattail Cove State Park, offering a range of amenities for the whole family. Located on the Colorado River between Headgate Dam and Parker Dam, about 12 miles from the city of Parker, Buckskin Mountain State Park is 18 miles long, very picturesque, and full of wildlife. Surrounded by mountains on both sides of the Colorado River, the park offers wonderful scenic hikes with breathtaking views and a range of other activities such as volleyball, basketball, and boating. Swimming is great along the grassy shore and the river is full of fish. Anglers can try their hand at catching large bass, smallmouth bass, catfish, and carp. There is a well-organized campground with a restaurant, a kids’ playground, a boat ramp, and a store. Located on Lake Havasu, Cattail Cove State Park stretches over 2,000 acres near Havasu City and is a popular family outing spot all year round. The lake is 45 miles long and great fun for boaters, not to mention a delight for anglers who are hoping to catch largemouth and striped bass, flathead and channel catfish, crappie and bluegill. There are several hiking trails that make about a mile and half together, mostly easy and relaxed. The best time to go hiking is in March, when the wildflowers are in full bloom. There is a beautiful sandy beach at the day use area of the park, but swimming is nice in many of the small, hidden coves around the lake. West Wetlands Park is a 110acre popular urban park in the city of Yuma. It has two distinct areas: The “lower bench” with native grasses and trees, and the “upper bench,” developed for recreation with a lake, several picnic pavilions, barbecues, kids’ playgrounds, and lovely landscaping. Centennial Beach is part of the park with a nice sandy beach on the river, next to the boat ramp, perfect for cooling off on a hot day or for building a sand castle. 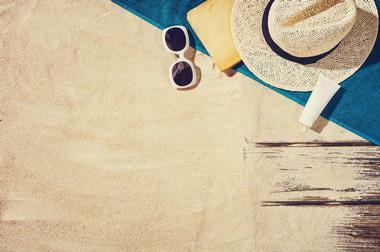 It is not the ocean and there are no waves, but it is fun to feel the sand between the toes. Miles of walking trails wind through the park. Somewhere along the way, hikers can see a statue commemorating the 1st Iowa Volunteers, the Mormon Battalion. There is also a solar demonstration garden, a hummingbird and butterfly garden, and a fascinating burrowing owl habitat. Lake Havasu and the surrounding stretches of the shore of the Colorado River have many wonderful sandy beaches, but most of them are accessible only by boat. Skier’s Island is a large rock with a natural cove, popular with water skiers and wakeboarders, while Bridgewater Channel is so popular with boaters that they create a regular weekend boat parade. The “Sand Bar,” a lovely half-mile-long, wide sandy stretch, is the most popular local gathering place on the river and is located about one mile north of Blankenship Bend. Friendly Island, or Beaver Island, is located about 4 miles from the London Bridge and has a few lovely, secluded sandy beaches with easy boat access. Steamboat Cove is one of the largest protected quiet coves on the river and has a nice stretch of sandy beach. Cattail Cove and Three Dunes on Lake Havasu also have some really nice beaches as well as small coves great for catfish and bass fishing. Located on Lake Havasu, which was created when the Colorado River was dammed by Parker Dam, Lake Havasu State Park stretches along the lake’s picturesque shores. It is known for its many sandy beaches, 47 great campsites, scenic hiking trails, and three boat ramps for all kinds of boats. The park is located near Lake Havasu City and the famous London Bridge. The 1.75-mile-long Mohave Sunset Trail runs along the lake shoreline and through the picturesque lowland desert, while the Arroyo-Camino Interpretive Garden features examples of the diverse plant and animal species that live in this part of the desert. There are many species of birds, several kinds of lizards, and desert cottontails. 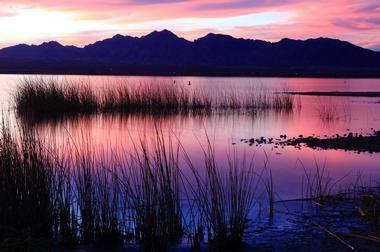 Patagonia Lake State Park, established in 1975, is snuggled amongst South Arizona’s rolling hills. It is the place to come to see white-tailed deer freely roaming the surrounding hills as well as elegant great blue herons on the shoreline of Lake Patagonia. For those who want more action, the park has a lovely beach, a boat ramp, a campground, a picnic area with tables and grills, a scenic creek hiking trail, and a marina. There is a boat rental place at the nearby Lakeside Market. The campground has a wonderful location overlooking the lake and is always full of eager anglers trying to catch bass, crappie, bluegill, trout, or catfish. The lake is also great for water skiing. Beneath its deep waters are the remnants of the historic New Mexico–Arizona railroad tracks. There is a nice hiking trail along the creek, a perfect spot to see many local birds such as the canyon towhee, vermilion flycatcher, Inca dove, or black vulture. A part of the larger Buckskin State Park and located on the Arizona banks of the Colorado River, River Island State Park is a popular spot for camping as most of its 37 tent campgrounds overlook the water. The park has decent amenities with a lovely sandy beach in a charming secluded cove, a boat launch, and a picnic area with a pavilion. There are miles of hiking trails and access to the back-country road for off-road vehicles. The views of the mountains along the trail are magnificent. The park is used all year round because of Arizona’s mild weather, especially for fishing. Located about 6 miles from Safford, Roper Lake is a 400-acre state park on the Gila River, surrounding a lovely 32-acre lake. The park is popular for hiking and all kinds of water activities. There is a nice beach for swimming in addition to a natural smooth stone tub. There is a picnic area and a campground as well as cabins available for rent. The park is popular with both birdwatchers and anglers, as the lake is stocked with trout and bass. Only small motor boats are allowed on the lake. The park is surrounded by magnificent Mount Graham, part of the Pinaleño Mountains. 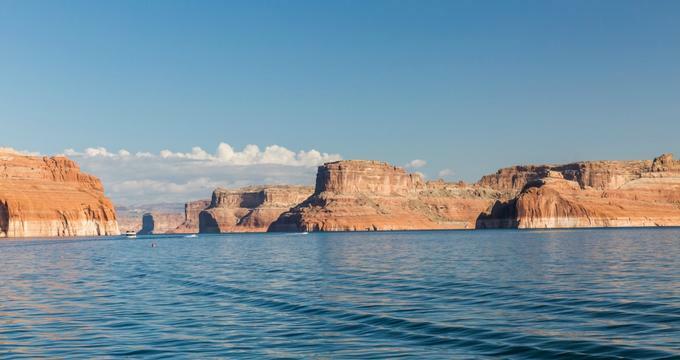 Wahweap Bay is the largest bay of Lake Powell, close to Glen Canyon Dam and the town of Page, Arizona. The bay is the most popular of the many scenic lake bays and tends to get quite crowded on holidays and weekends, both with boaters and people enjoying its hiking trails and well-managed campgrounds. There is the Wahweap Marina for the boaters, only a short walk from the road for those who arrive by car. Most campgrounds are around Lone Rock Beach and Glen Canyon Dam. Hikers can also extend their exploration along the bay in one of the many canyons.